48" Window Box, Wall Trough with Coconut Liner. Add color and character to your home. Wrought Iron Window Boxes that people will talk about. Great solutions for a beautiful home or business. 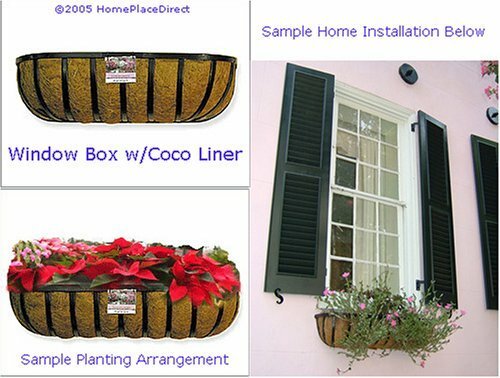 Our traditional Window Boxes or English Hay Racks are also known as "Wall Troughs" in Europe. From townhome to country estate, they dot the European landscape of manicured homes. They help define Charleston as one of America's most elegant cities. Whether filled with spring bulbs and pots, overflowing summer greenery, winter evergreens, holiday decor or even cacti, they provide the elegant detail necessary for a polished look. Their rugged heavyweight welded steel frame is completely coated in a semi gloss polymer plastic finish, to retard corrosion and rusting. They are built to last. Each comes with a handsome all natural preformed coco liner; not the odd plastic filament ones available elsewhere. There are fastener holes are in the back of frame for a secure mounting to any flat surface windows, walls or fences. They are available in a wide range of sizes and ship quickly and securely. Transform your home with these ideal window boxes. Unlike wooden ones which warp, crack and peel these simple but elegant hay racks will serve you for many beautiful years. Fastener holes are in the back of frame for a secure mounting to any flat surface windows, walls or fences. The preformed coconut liner keeps it neat and tidy inside, and connects it to nature outside. These coco liners create a "down-to-earth" feel and enhance the planters' connection with nature. They keep the aesthetic design of the planters from being spoiled by unsightly roots and dirt, but still produce the effect of a natural growing environment. Wrought Iron Accessories for fine homes and gardens. Flowers in picture are not included with purchase. Excellent for home or business; approx. 48 x 7" x 6.5"
If you have any questions about this product by HomePlaceDirect, contact us by completing and submitting the form below. If you are looking for a specif part number, please include it with your message.